Files come in many profiles or shapes. 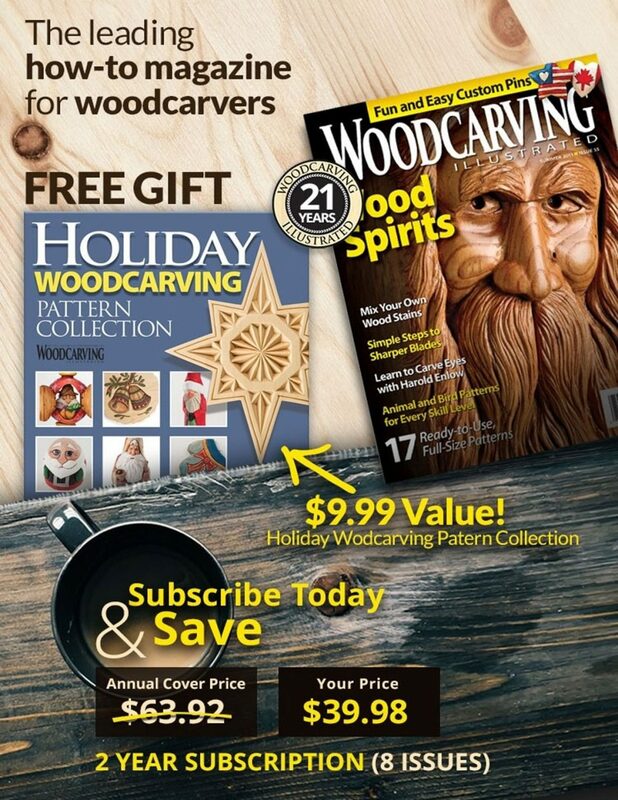 While purists will argue that files, rasps and rifflers, not to mention sandpaper, should never touch a wood carving, don’t sell these tools short. Many projects need a smooth surface, not a flat-plane or faceted one. 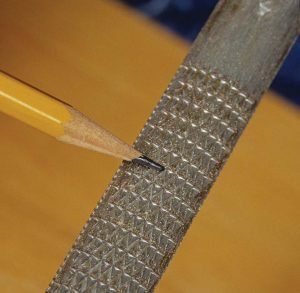 These versatile tools can shape, smooth, even sharpen if necessary, and are actually economical alternatives to sandpaper. They are ideally suited for working oddly shaped areas and difficult wood grain, as well as roughing out. A single file removes wood as quickly as a large rotary cutter and produces a finished surface that rivals 220-grit sandpaper for smoothness. You need to understand both the cut of the teeth, that look like lines, and how coarse or smooth a finish they make. From coarse to smooth, the distance between the teeth diminishes. However, a smaller file has teeth closer together, even if it is labeled coarse. In general, the longer the file, the coarser it is. To help the consumer, manufacturers often stamp the cut between the first row of teeth and the tang.A file has three main parts: the length, which is the cutting surface covered with teeth; the tang, which is where the handle is attached (never use the tang as a handle); and the heel, which is the transition between the length and the tang. Files come in wide variety of types and profiles. Once you’ve determined what type of file is best suited for the job, you can further refine the usefulness of the tool by selecting the correct profile or shape. The coarse teeth of a rasp resist clogging. Rasps make deeper and coarser cuts than files because they have separate and triangular, rather than parallel, lines of teeth. Rasps scrape away wood rather than plane it away as files do. The rasp is well suited for shaping wood quickly. Files have gullets or spaces between the teeth that fill with wood chips. One advantage a rasp has over a file is that the teeth resist clogging, but rasps are only available in a limited variety. The size and distribution of teeth determine a rasp’s degree of coarseness and the amount of wood it can remove. All cut rapidly but will leave a rough surface. 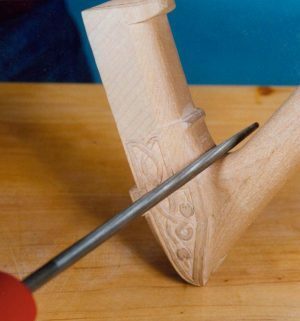 Needle files are designed for very precise work and leave a smooth surface on wood. A good set will consist of as many as 12 second-cut files, but purchase one that offers an interchangeable handle. Sets of needle rasps are also available. Rifflers give you access to tight areas. Riffler comes from a French word meaning to file or scrape. 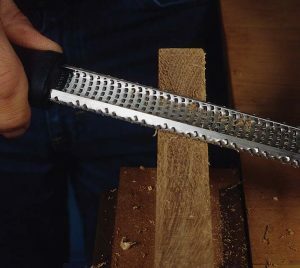 A riffler is a small, double-ended file, rasp, or both, with a gripping area between the cutting edges. It is fashioned to work in tight spaces. Common end shapes include straight, curved, and knife-like. Rifflers come in a variety of profiles, such as oval, triangular, square, round, and half-round. Microplane’s stainless steel blades, which come in round, triangular, and flat shapes, offer razorsharp edges. I tried my flat-blade Microplane on a piece of white oak and was more than pleased with the results. The wood disappeared without a great deal of effort. 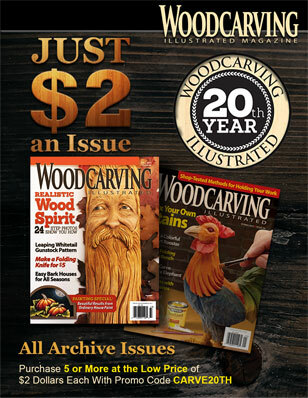 For the power carver, there are 1″ and 2″-diameter rotary cutters with ¼” shanks. These tools should be used on a drill press running at a maximum of 1200 rpm, not in a hand drill or flexible shaft tool. Draw filing cuts on the push stroke. 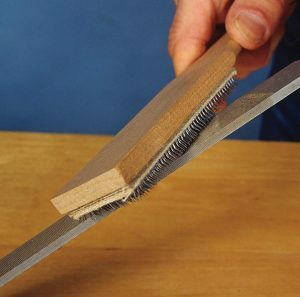 Draw filing, a finishing stroke, requires you to hold the file in both hands at right angles to the wood and push across it with light pressure. Since the teeth of files cut only on the push stroke, lift the tool up on the return stroke. A beginner’s problem is over doing the push stroke operation, resulting in an unwanted hollow. Cross filing is done at an angle, not straight across as the name might suggest. 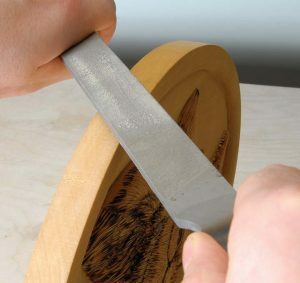 Hold the file with both hands and apply enough pressure so the teeth do not catch on the wood grain and cause the file to skip over hard and soft grain changes. Working at an angle is critical when using rasps. 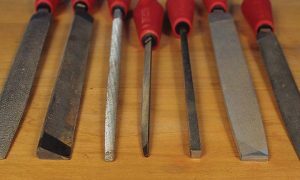 Filing parallel or perpendicular to the grain will tear and break the wood, leaving the surface ragged, with a lot of follow-up work required. Cross filing will prevent that from happening. 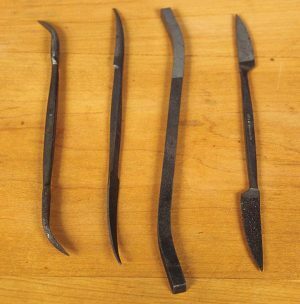 While files are made from ultra-hard steel and tempered hard to give the teeth a long life, they do tend to be brittle and are easily broken. 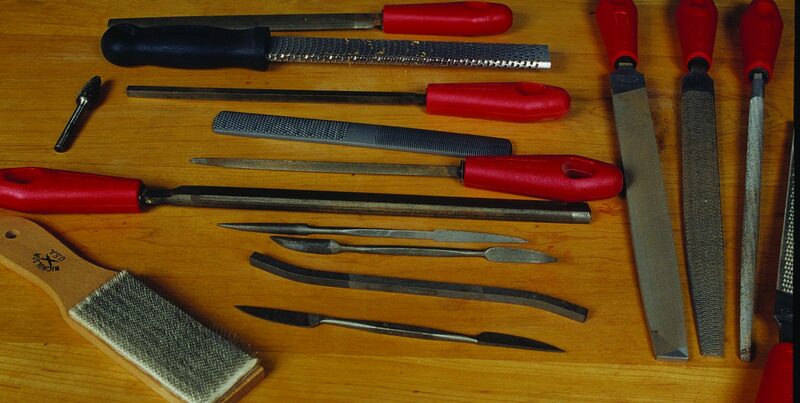 Files are not designed to pry, hammer, or clash with other metal tools. Use them for what they were designed for, and they should last several lifetimes. Keep files hanging up and away from other tools. If wallspace is at a premium, then keep them stored, but separated, in a drawer to protect the teeth. Since files, like most other steel implements, are prone to rust, it’s wise to keep a few bags of silica in the drawer to draw off moisture. A file card is the best investment you can make for unclogging a file that has filled with wood chips. Purchase one that has nylon bristles on one side and short, stiff steel teeth on the other. Badly clogged files require you to brush the file with the steel teeth. Stroke the brush parallel to the file’s teeth. If you want to prevent heavy clogging, use the bristle brush frequently. If you chalk the teeth heavily prior to use, it will discourage clogging. Do not oil a file; it will make it difficult to dislodge dust and wood chips.